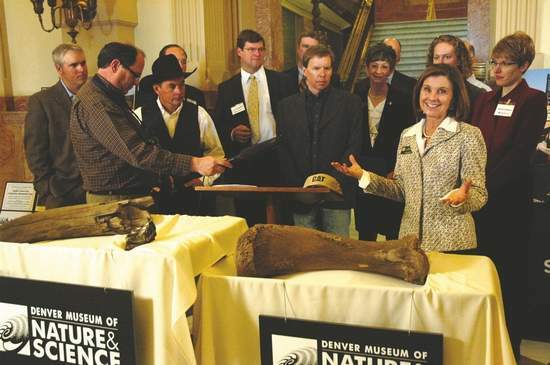 Contributed photoState Sen. Gail Schwartz, right, shows off mastodon bones Thursday in the state Capitol building in Denver. DENVER – Colorado legislators honored Gould Construction and other key players Thursday for the discovery of Ice Age bones during the enlargement of Ziegler Reservoir near Snowmass Village last fall. State Sen. Gail Schwartz, D-Snowmass Village, and Rep. Laura Bradford, R-Collbran, introduced Senate Joint Resolution 18 to recognize the discovery and honor those who worked on the project. “The Senate stopped their normal proceedings and brought a molar, shoulder blade and the tusk of a mastodon onto the floor, along with some big pictures,” said company president Mark Gould, who went to Denver for the ceremony along with company employees Jesse Steele and Kent Olson. “Then we went over to the House and did the same thing. In the Senate, Sen. Schwartz introduced the resolution, and in the House, Rep. Bradford introduced it,” Gould said. Bradford noted proudly that Steele, who lives in Grand Junction, is a constituent from her Mesa County district. Also attending were Snowmass Village Mayor Bill Boineau, Town Manager Russ Forrest, Snowmass Water and Sanitation District president Doug Throm, and Denver Museum of Nature and Science curators Ian Miller and Kirk Johnson. Gould Construction, based in Glenwood Springs, was in the midst of excavating dirt on Oct. 14, 2010, in order to enlarge the earthen dam for the sanitation district’s Ziegler Reservoir. As he was bulldozing the site, Steele realized that huge bones were coming up along with the dirt. Rather than plowing forward, he stopped work. What ensued, said Gould, was the discovery of preserved bones of a Columbian mammoth, followed by discoveries of other extinct Ice Age species in what is likely the most significant find of its kind in the Rocky Mountains. The joint resolution retells the exciting discoveries that unfolded over the following month. It goes on to commend the workers of Gould Construction, the Snowmass Water and Sanitation District and the Denver Museum of Nature and Science, along with the residents of Snowmass Village, for the great care they took to preserve the discovery. During four weeks of excavation, crews recovered eight to 10 American mastodons, four Columbian mammoths, two Ice Age deer, four Ice Age bison, one Jefferson’s ground sloth, one tiger salamander, distinctly chewed wood that provides evidence of Ice Age beavers, iridescent beetles, snails and microscopic crustaceans called ostracods, and large quantities of well-preserved plant matter. The fossils are currently being preserved in the museum’s conservation lab in preparation for scientific study. The museum staff will be back on the site from May 15 to July 1 this year to excavate about 3,000 cubic yards of dirt, clearing the way for a contractor to build the new earthen dam for the reservoir starting in July. Gould said he has been informally consulting with Miller, Johnson and other museum staff to prepare for the logistical challenges of digging, sifting through and moving that much dirt, which is expected to all be done by hand with the help of volunteers.